San Myshuno isn’t just a neighborhood or a place for your Sims to live in The Sims 4 City Living* Expansion Pack (coming November 1st!) 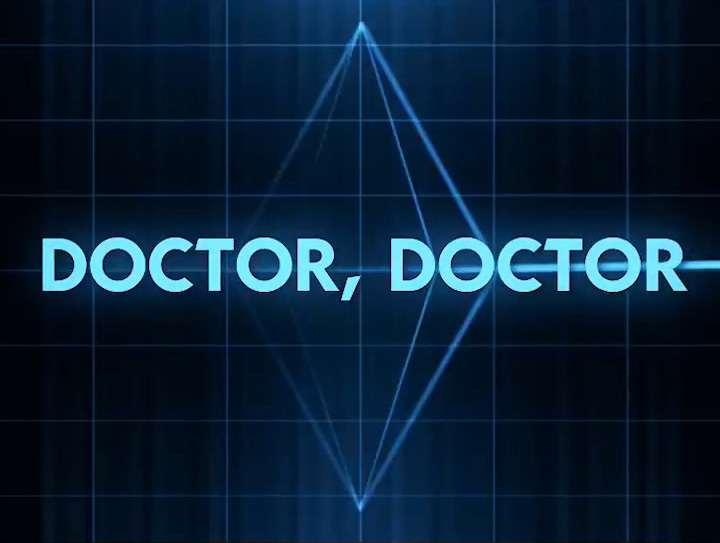 – it’s an entire character by itself. We wanted San Myshuno to have as much character as our favorite cities in the world, so that when Sims go there, you can say “wow, that is new!” Let’s talk about some of the cool, weird things you’ll find exploring the city of San Myshuno! Hit the Festivals! You may or may not know that San Myshuno is a city with festivals! Festivals are like venues that come and go, bringing with them new game-play, new stories, and new contests for your Sims. Festivals are perfect for foodies, lovers, geeks, and even those who love hunting for a good deal. Every neighborhood has a different festival, so send your Sims outside to join in the fun before they close! Try new foods. We wanted to make San Myshuno a diverse city with interesting cultures, and the most delicious part of culture is food! San Myshuno introduces food stands with dozens of new recipes. Plus, to make it a little easier, your Sims can learn the recipes just by sampling, which pairs perfectly with our new City Native Aspiration. Your Sim can really get out there and sample the world’s delicious cuisine! Collect snow globes! People throw junk out all the time in the cities, but one Sim’s junk is another Sim’s treasure! Keep your eyes peeled for cardboard boxes on the streets. Your Sims might find snow globes to complete the new collection. Shoot some Hoops. We’ve wanted to add the basketball hoop for a long time, and San Myshuno is the perfect setting for this object. Your Sims can head to the court in the Spice District, or build one in their penthouse high rise, to shoot the hoops with friends after work. Basketball is the perfect way to burn a few calories gained eating samosas from the food cart, and to make new friends! Meet interesting new Sims. San Myshuno is filled with fascinating people. There are buskers hoping your Sims will spare a few Simoleons in tips. There are living statues who may, or may not, be convincing. There are tourists bumbling about. You might meet the next Sim that’ll be your Sim’s next roommate, or even soulmate. Or, perhaps you’ll encounter a bizarre…trash panda? We’ve said too much. Let's just say that San Myshuno is full of interesting Sims! Try out Graffiti. We always want to give Sims a way to express themselves and affect the world around them, which made murals a perfect addition to San Myshuno. Sims who love to paint can shake their spray can to add graffiti, a beautiful community mural, or even deface something that a rival painted. Don’t settle for bland concrete when there are all the possibilities of a mural at your Sims’ finger tips! Master Karaoke. 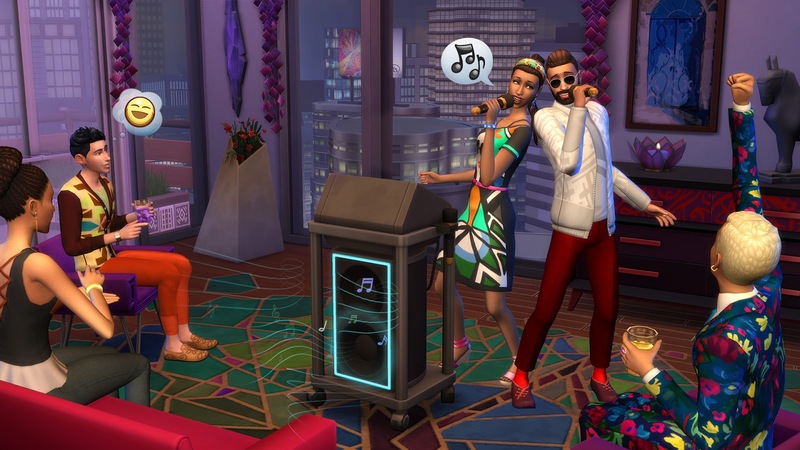 We're introducing the Singing Skill in The Sims 4 City Living, which means you may hear Sims singing joyfully, or badly, out on the street corner. Send your Sims to join with the sing along, or send them to the nearby Planet Sing-Pop Karaoke bar. Either way, music is in the air.... even if it’s sometimes off-key. Stand for a cause. Your Sims can try out three new careers in San Myshuno, including the Political career, which is perfect for Sims with a cause in their hearts and a sign in their hands. Sims can protest on the streets of San Myshuno, or if they move up in the career, they can give speeches to the crowd from their podium. Spread the good word and make the citizens of San Myshuno more conscious. San Myshuno is a vibrant urban environment and the crown jewel of The Sims 4 City Living. We cannot wait until your Sims move into the city and hit the sidewalks to learn about all the content we’ve jam packed on the pavement, on November 1st 2016. Afternoon, Morning, and Evening Simmers! Some new assets for your Sims to celebrate the Day of the Dead! …which technically isn’t until the end of October. 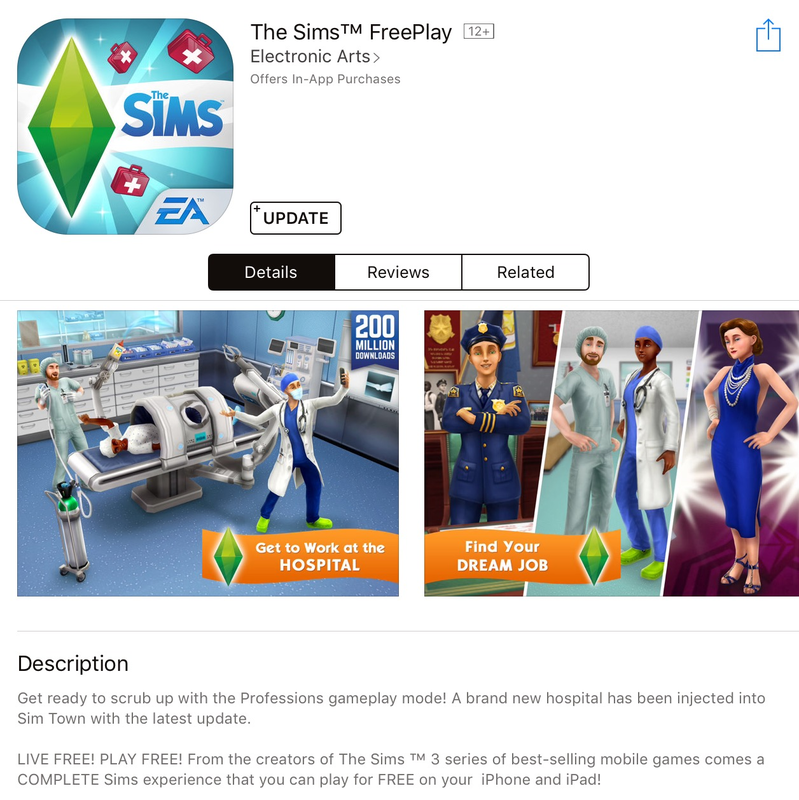 … but they’re Sims. So, technically any day can be the end of October. So you were saying, what’s new? A new recipe for Pan de Muerto is available under the Cook… interaction. Two new wall hangings, a table, some candles, and a sculpture. There are also several new outfits for your Sims in Create a Sim! Male and Female Sims have a new full body outfit, plus face makeup. Female Sims have a new hair, and Male Sims have a new hat. Children also have a new full body outfit and face makeup. And since we are on the subject of October… turns out Oct 1st marks the end of a quarter… so, that’s a thing. Also, the end of a quarter has ridges. Did you know that if you are only looking at one side of a ridge, you can’t see the other side? But if you wait, and let yourself move forward… just a short bit, you might find yourself on the other side of the ridge, able to see more. Is it better on the other side? It might be, but I suppose in the end it all depends on the perception of which side of the quarter you are looking from, and prefer. And with that little bit of wisdom, I wish you a happy Release Tuesday! Sul Sul! We’re delighted you decided to join us today for our quick, informal tour of San Myshuno, the new World in The Sims 4 City Living* Expansion Pack. Watch your step and let's get going! San Myshuno was inspired first and foremost by diversity. We knew we wanted a diverse, vibrant, modern city where you might see people of Indian, Arab, Japanese, African, and other ethnicities. We wanted to create a colorful melting pot inspired by different cultural canvasses. We initially drew inspiration from Asian cities like Shanghai and Tokyo, but they were too intense with the lights, and felt a bit too focused on single cultural groups. Then, we looked to coastal cities like Vancouver, San Francisco, New York, and Sydney, as places known to host hugely distinct cultures in unique neighborhoods. San Myshuno is divided into four neighborhoods inspired by different cultures and offer different activities, apartments, and festivals for your Sims. Let’s visit each quickly, shall we? The Spice Market - A comfortable, old neighborhood marked by its distinct brownstone apartments and colorful mosaics. We were inspired by Indian colors and visual elements for this neighborhood. The Spice Market is the home of the Spice Festival, which is the perfect place to sample foods from different cultures (while also obliterating your Sim’s taste buds with spice!). 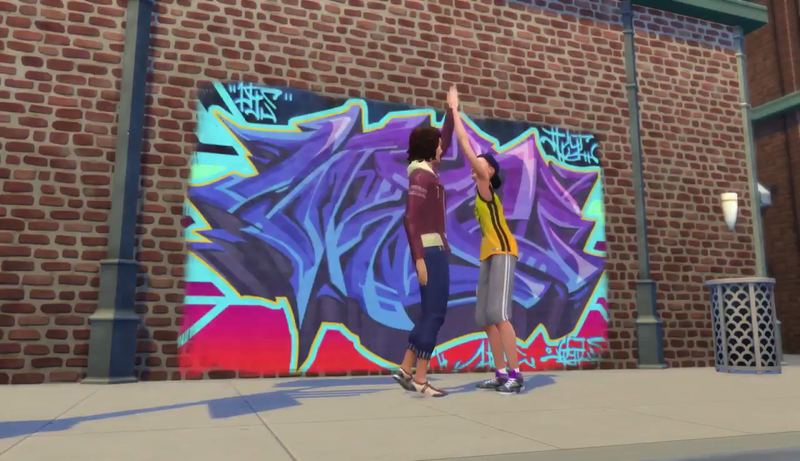 There are some very affordable starter apartments here, and your Sims will certainly enjoy themselves in a pickup game of basketball, or spraying some graffiti with friends. The Arts Quarter - Practically a sculpture itself, and is one of our more beautiful neighborhoods. Those who have been to San Francisco might recognize elements of the Yerba Buena Center across the street from the SF Museum of Modern Art. The art museum here in San Myshuno is really top notch, and aspiring musicians will seek their next tip here near the food stands. The Lantern Festival will pop up in the Arts Quarter from time to time, which is great, as it’s the perfect place for your Sims to view the fireworks! The Fashion District - We're definitely moving up the economic ladder here, but it offers truly spectacular views and neighborhood entertainments! Be ready to pay a stiffer price in rent if your Sims move in here. The Fashion District and Uptown are both inspired by the high-tech high rises of cities like Tokyo and Shanghai. The Fashion District is the home of the lively (and sometimes unruly!) Planet Sing-Pop, where vocal hopefuls go to belt out the latest tunes with friends and significant others. When auditory atrocities aren’t pouring forth from the karaoke bar, Sims might wander onto the street itself to enjoy the peculiar sights of GeekCon or maybe even find love at the Romance Festival. Uptown - The final district, and one which has a truly breathtaking view with some wonderful high-rise options for Sims who have the bankroll to spare. Uptown is the home of the gym & rooftop lounge, and it’s also the final destination for Sims who have risen to the top of their career and now wish to rise to the top of the skyline. We’ve never made a world like San Myshuno. It’s jam packed with diverse and exciting people, new activities like festivals, and venues that’ll entertain Sims otherwise cramped in their small starter apartments. Your Sims will want to move to San Myshuno the second it’s open, which is this November! Build Mode to add quirks to their penthouse, or any lot in the game. Yes, even in Willow Creek or Oasis Springs! This is one of the new Build features we’ve added to The Sims 4 City Living, which we’ll cover in greater depth later. 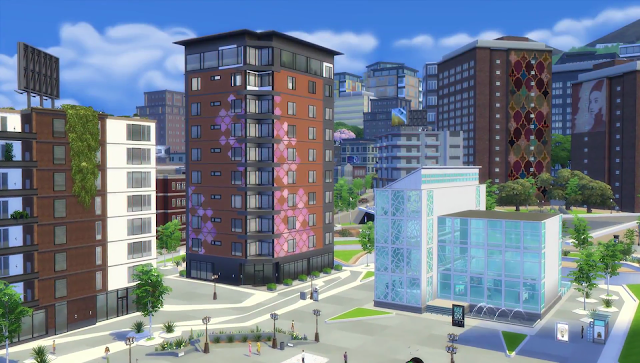 The Sims 4 City Living: Apartments Trailer! Welcome to San Myshuno, the new World in The Sims 4 City Living* (coming November 1, 2016). Here, a Sim’s dreams can be made, or broken, at the sight of yet another cockroach outbreak. When you live in the city that means apartment living, which is a completely different experience to the residential lifestyle. Press the button on the elevator for your floor, and let’s go through why apartments are unlike anything you’ve played yet in The Sims 4. It means living in a community. We wanted to focus on the community aspect of apartment life, which is oh-so familiar to many members of The Sims team. In suburbia it’s easy to ignore your neighbors, but not in apartments! You’ll see them in your Sim’s apartment common area checking the mail, yelling at your Sims or the other neighbors, or merely coming by to visit. Or maybe borrow your Sim’s things, like a shower, or a taste of your Sim’s dinner. First and foremost, the apartments are about other Sims and how they affect your life. San Myshuno has some of the most interesting, diverse, and exciting Sims we’ve created. We cannot wait for you to meet them! The walls are... sort of thin. Community is nice, but living in such close quarters has its downsides. Or upsides, depending on how you view things. Some apartments are noisy with late night music and… let’s call it romance. If things really get out of hand, you can send your Sims to bang on their neighbor’s door to tell them to “turn it down!” But, this isn’t a one-sided affair! Your Sims neighbors have ears as well and they also value a little solitude. Really, it’s about volume control and being considerate, right? They're full of wacky characters. We didn’t want to just fill apartments with people, we wanted interesting people! Inspired by our favorite television sitcoms, we tried to drizzle every apartment complex with strange, eccentric, enthusiastic, and overly neighborly Sims that will make the lives of your Sims all the richer! Mostly. They have their own quirks. While designing The Sims 4 City Living, we frequently recounted to one another stories of bizarre landlords, strange roommates, and apartments that seemed cursed. Well, we wanted all of that in the expansion pack! Apartments in the game can have quirks, almost like personality Traits for Sims, that range from cursed, to haunted, to earthquakes! Every Sim’s apartment is unique, and as a result, we think you’ll have more fun than ever moving between apartments until you find the one that’s just right for your story. Apartments can have some problems. Some apartments have issues that veer wildly away from “quirk” into outright problem territory! Leaky pipes, faulty electrical wiring, and pests! Look, nobody said moving to the big city on a budget would be easy. Your Sims will need to move to San Myshuno, get a hot new career, and work their way out of the lower quality apartments. This is a good thing! These problems drive stories, build characters, and will let you be more familiar with your landlord. You'll need to deal with your landlord. Speaking of the landlord, every apartment has a well-meaning, overalls adorned steward of the leaky pipes and hallway complaint. If something breaks, give the landlord a call if you don’t have time or interest in fixing it yourself. Be careful to stay on their good side, and be doubly sure your Sims pay their rent on time, else your Sims will find themselves on the landlord’s bad side! The view of the city is fantastic. Apartments come with a hiccup or two, but they also provide one of our favorite benefits – the view! Your Sims can look out the window to see a huge, vibrant city that is jam packed with things to do. We’ll cover this more soon, but your Sims will see festivals begin, protests initiate, or friends begin a pickup game of basketball downstairs at the park. 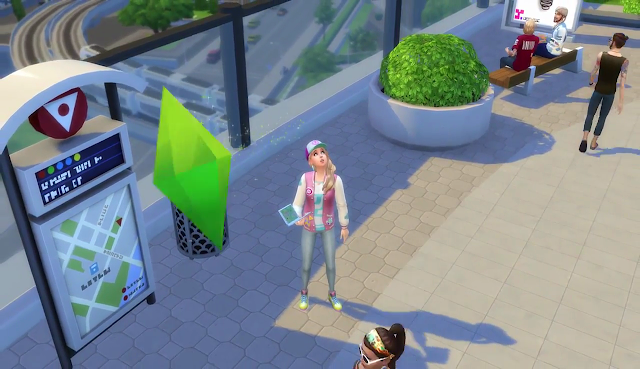 Apartments give a window to all the things your Sims could be doing. Space is limited. Want more space in your house? Knock out a wall or build another level! That doesn't work with apartments. Apartments are snug, especially if your Sims are sharing it with a few roommates! On one hand, roommates help pay for the rent, but on the other, there’s no room! Your Sims will need to prioritize the things most important to them, learn to love their fellow Sims, or simply get out of the apartment to find their fun at the festival. We wanted our low-end apartments to feel low end, both to help you tell a great story, but also to give you something to strive for with your Sims – more space! Close to everything. San Myshuno itself is as jam-packed as the apartments your Sims inhabit. We’ve never created a world with more to do for your Sims! By simply taking the elevator down, they’ll find themselves right in the thick of great, wonderful, spicy, exciting things. But, that’s for another day. Just know your Sims have never lived anywhere quite like the apartments in The Sims 4 City Living. They’re amazing, at least according to the landlord, and we cannot wait to hear your stories of apartment living. We can't wait for you to move your Sims in to their first apartment in San Myshuno, with The Sims 4 City Living, coming this November. The Sims 4 City Living: Official Trailer! The Sims 4 City Living News: Coming November 1st, 2016! The Sims 4 City Living is Coming Soon! The Sims 4 City Living is set in the rich, diverse city of San Myshuno, a beautiful coastal city tucked up against the nearby mountains. You’ve never seen a city like this in The Sims! San Myshuno is packed with things to do and new people to see. Whether you're playing basketball in the Spice District or meeting with friends after work at the Karaoke Bar for a raucous good time, there are new experiences around every corner. Better yet, why not meet some friends and head to one of the new festivals? 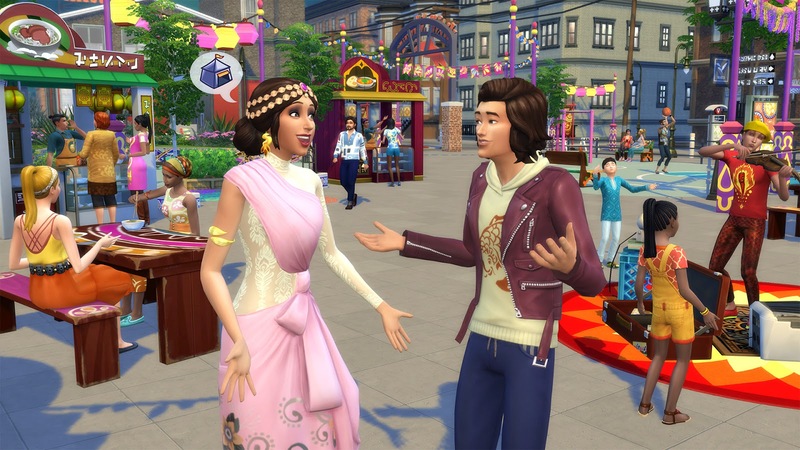 San Myshuno is full of dynamic street life, so whether you take a hot date to the Romance Festival, or geek out at Geekcon, there’s always something new to do. There are five different Festivals that can show up, giving you plenty to see from your apartment window. Speaking of apartments, your Sim will need to find one once they move into San Myshuno! Apartments bring with them an assortment of interesting characters and quirks. Unlike houses, you're more limited in what you can do (the landlord won't be happy with you knocking out walls and building new bathrooms), but there's a lot of gameplay found in the few hundred square feet of your Sim's new apartment. But don't worry, not everyone who lives in the city is wanting for space. As you work your way up through one of the new careers (Politician, Critic, and Social Media), you can afford a stunning new penthouse on the top floor! Penthouses provide a totally different experience, and we can't wait to tell you more about them in the coming months. 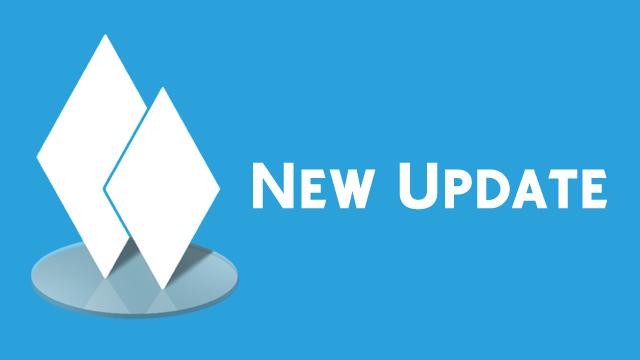 We’ll be sharing so much more information in the near future. Before long, you’ll know everything there is to know about San Myshuno, apartments, Festivals, and more. Stay tuned and pack a small bag for the city. Your first apartment may be tiny! 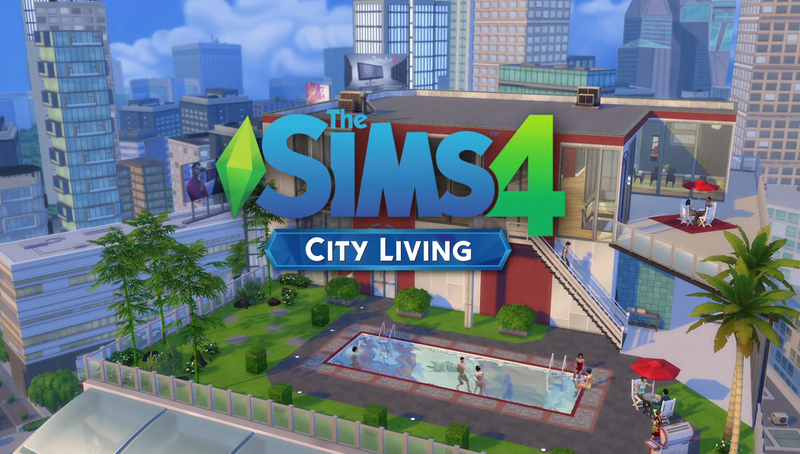 The Sims 4 City Living releases worldwide for PC and Mac November 1, 2016! Survive your first shift as an Intern and take on various roles, including a Care Assistant or Candy Striper! Earn resources to expand your hospital – add a Pharmacy, Psychiatrist’s Office and Radiology Center, complete with an X-Ray Machine! Bertahan di shift pertama sebagai pemagang dan mengambil berbagai peran, termasuk Asisten Perawat atau Perawat Sukarelawan! Bekerjalah dan dan pimpin rumah sakit sebagai Kepala Perawat, atau menjadi Kepala Dokter Bedak kelas dunia. Dapatkan sumber bahan untuk memperluas rumah sakit – tambahkan Parmasi, Ruang Psikiater dan Pusat Radiologi, lengkap dengan mesin Sinar-X!